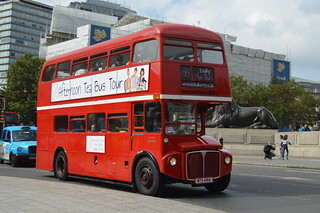 RM 909 is another Routemaster addition to the daily “afternoon tea bus tour” that circulates around Westminster. This is in addition to RM 191 that is already in service. RM 909 Is seen in Trafalgar Square on Saturday 13 September 2014.